ĐỒNG THÁP – The Mekong Delta province of Đồng Tháp is encouraging farmers to grow more fruits to good agricultural practice (GAP) standards to improve incomes and sustainability. It has more than 600ha of VietGAP- and GlobalGAP-standard orchards, according to Nguyễn Phước Thiện, deputy directorof the Department of Agriculture and Rural Development. Mango and longan account for the lion’s share of these fruits. The mangoes are exported to many markets, including South Korea, Japan, Russia, Italy, and Hong Kong. The province, the delta’s largest mango producer, has more than 9,000ha under the fruit, while mango is one of its key agricultural products. Farmers who grow mango to VietGAP standards earn VNĐ200 – 220 million (US$8,620 – 9,460) per hectare per year while those who grow traditionally earn VNĐ150 – 160 million ($6,450 – 6,890), according to the department. The province has also designated six areas with a combined area of 416ha in Cao Lãnh City and Cao Lãnh District to grow clean mangoes in the off-season to avoid oversupply during the main season. It has in fact designated specific areas for specific fruits such as for longan in Châu Thành District, pink mandarin in Lai Vung and xoàn orange in Lấp Vò and Lai Vung districts. The province, which had more than 25,000ha under fruits as of 2017, plans to expand this to 30,057ha by 2025, including 11,055ha of mango, 8,460ha of various citrus fruits and 5,720ha of longan. In 2016 the Mỹ Xương Mango Co-operative in Cao Lãnh District began selling mango trees to customers through its website, https: xoaicaolanh.com.vn, thus offering a steady income to its members and clean fruits to consumers. The trees sold under the “My home mango tree” model, cost customers VNĐ3-5 million ($129 – 215) a year per tree depending on their previous yields. Customers can get 100 – 150kg of mangoes for a year from their tree. In case of a poor harvest, customers still get 70 per cent of the quantity guaranteed in the contract. The mango trees sold under the model belong to three varieties: local specialities Hòa Lộc and Cát Chu and Taiwanese variety xoài tượng da xanh. The mango trees sold online meet criteria like having fruits that are consistent in size, fruiting well and meeting VietGAP standards. When a tree is sold, its owner is responsible for tending the tree, pick ripe fruits and deliver them to the customer. The trees sold on the website are assigned a number, and buyers can check their current status on the website. The co-operative’s members have so far sold more than 230 mango trees to customers, earning more than VNĐ900 million ($28,770). Many of the buyers are from HCM City and Hà Nội. 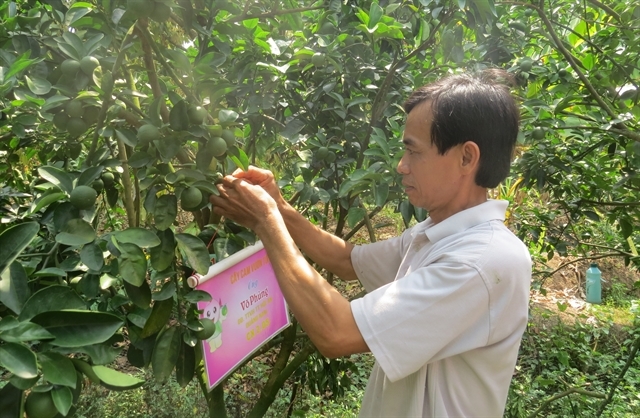 The success of “My home mango tree” spurred the launch of “My home orange tree” last year by farmer Võ Văn Nang in Cao Lãnh City’s Tân Thuận Đông Commune. Planted in 2012, Nang’s orange orchard has more than 200 xoàn orange trees which each yield 80 -100 kilogrammes of sweet and juicy fruits a year. He does not use chemical fertilisers or pesticides in his orchard. The trees are sold on the website https://nongsancaolanh.vn with similar conditions as Mỹ Xương. Last year he sold 35 orange trees at a price of VNĐ4 million ($170) each for a period of a year. Fifty trees have been bought so far this year. According to Lê Nhựt Trường, chairman of the Tân Thuận Đông Commune People’s Committee, Nang’s model of producing clean products is an example the commune encourages its farmers to emulate. It plans to instruct farmers to grow clean produce to meet the market demand and improve value.